Charlotte trained at the Royal Ballet School and Elmhurst Ballet School. She then joined Northern Ballet Theatre, where she became a Principal Artist dancing roles such as Juliet in Romeo & Juliet, Kitri in Don Quixote, Lucy in Dracula the title roles in Cinderella and Giselle and in Didy Veldman’s Carmen. She then spent five years with The Cullberg Ballet, Sweden, where she danced the role of Aurora in Mats Ek’s Sleeping Beauty, and worked with choreographers, Ohad Naharin, Jiri Kylian, Johan Inger, Stijn Celis and Didy Veldman. She also danced in Mats Ek’s Swan Lake, She Was Black, Fluke and A Sort Of. 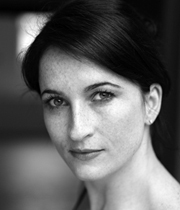 Since returning to the UK, she has danced the role of Mrs Alving in Cathy Marston’s adaptation of Ibsen’s Ghosts as well as roles in Marston’s Traces, Arcana and Dust. She has also begun collaborating with Director and Choreographer Will Tuckett, creating roles of the Fox in his production of Pinocchio, the Mole in Wind in the Willows, Edie in Faeries and Princess Bee in The Thief Of Baghdad. Charlotte has performed the role of The Queen on the international tour of Matthew Bourne’s Swan Lake and in The Most Incredible Thing at Sadler’s Wells ( Javier De Frutos). She went on to perform in The Bacchae at The Royal Exchange (Manchester) directed by Braham Murray. She has played the Bad Angel in Dr.Faustus at The Shakespeare’s Globe and the role of Lucetta in Shakespeare’s Two Gentlemen of Verona (Theatre Royal, Northampton) both directed by Matthew Dunster. Most recently, Charlotte choreographed A Midsummer Night’s Dream at Regent’s Park Open Air Theatre directed by Matthew Dunster.